"Best of luck lads. Hala Madrid." Late on Sunday, European and Spanish football champions Real Madrid arrived in Abu Dhabi to begin preparations for their semi-final FIFA Club World Cup match against the UAE&apos;s Al Jazira team on Wednesday night at Zayed Sports City. The club&apos;s official Twitter account posted footage of the squad&apos;s arrival into the capital of the UAE, which saw the manager and legend of the game Zinedine Zidane and players including Cristiano Ronaldo and Gareth Bale, disembarking the Emirates plane they had flown on. 🇦🇪👋 Abu Dhabi, we're here! "We have an opportunity to win another trophy for our fans"
The team is scheduled to train in Abu Dhabi both today and tomorrow before they go up against the Arabian Gulf League champions for a place in Saturday&apos;s final. "We have an opportunity to win another trophy for our fans", said the captain Sergio Ramos upon arrival in the capital, according to the official club website. "Now we have to fight to win our sixth Club World Cup. We’re really motivated after a great game against Sevilla and we’re on a good run at the moment. We must now look to maintain this balance and consistency," he added. 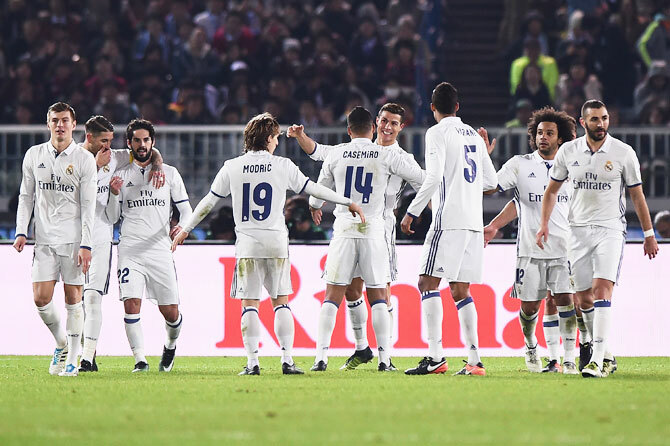 Real Madrid was in action in &apos;La Liga&apos; on Saturday as they defeated Sevilla 5-0, with Ronaldo scoring twice. The European champions are looking to become the first side in the tournament&apos;s history to retain the Club World Cup, having won it 12 months ago in Japan. The first semi-final takes place on Tuesday in Al Ain as Gremio go up against Pachuca. Who are Real Madrid&apos;s opponents? Al Jazira, nicknamed The Spider or the Pride of Abu Dhabi, share the same Chairman, Sheikh Mansour bin Zayed Al Nahyan, as Manchester City. The Pride of Abu Dhabi have only two league titles to their name, winning their first one in 2011 before winning it recently in 2017. Since 2010, they have also won three editions of the UAE President’s Cup. Regionally, the team only have one title, which is the GCC Champions League back in 2007. 📸 🛫 On board our @emirates A380 flight! "Welcome to the Middle East"